I presented this mini essay on The New VI TV station Speakers’ Corner where you can create a 2 minute video for a dollar. The Case for Free Range Eggs. I know some people who hire sadists to torture chickens. The sadists break off their beaks. They pack them in tiny cages so tightly they cannot even turn around. They wire their feet to the floor. Do you know who these people are? — people like you, too cheap to buy free range eggs. They buy factory eggs to save a buck. In the process they torture the chickens who provide the eggs. The motive is not sadistic pleasure, but merely to compete with the cheapest possible eggs. a dozen, the same as factory eggs. On 2012-04-26 when Burger King announced it was switching to cage-free (free run, but not free range) eggs, they the eggs would cost them only 1% more. Why are people exactly such cruelty on chickens for such trivial economic benefit? Chickens are not the brightest animals, but if you get to know them, they have personalities. They are affectionate. They have emotions. They don’t deserve this disgraceful treatment from you. Finally, free range eggs are better for you. Chickens grubbing in a field are far healthier than ones trapped in filthy disease-ridden cages. It will be blindly obvious if you buy half a dozen each of free range egg and factory eggs. The free range eggs have stronger shells, are less runny, with firmer yolks, brighter colour and taste much better. A cage egg tastes watered down. You won’t want to go back even if you relish the thought of making chickens suffer. The Meatrix: a takeoff on the movie the Matrix about the propaganda that holds factory farms in place. 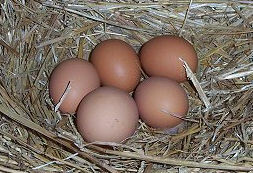 aka pasture eggs, free range eggs are eggs from chickens that are permitted to run around outside. This is the Canadian term. In the USA the term free range has no official meaning, so farmers can sell you anything they want and still label it free range. Buyer beware. Ditto for the terms cage-free, free-roaming and yard eggs. They should have noticeably yellower, firmer yolks than regular eggs. You can recognise them by their thicker shells, brighter, firmer yolks and thicker whites. Some companies such as Island Gold here on Vancouver sell a variety of types of eggs. These companies have no conscience. Free range eggs are just another profit line. They have no interest it reducing cruelty. You want to find a source that produces only free range eggs. Otherwise it is a bit like buying your free range eggs from Hitler. You don’t want Hitler to prosper in any degree. free run eggs are eggs from chickens kept in cages where they have enough room to turn around. Ordinary eggs come from chickens caged so tightly they can’t even turn around. This is the Canadian term. Helman’s mayonnaise advertises they use free run eggs, while depicting chickens running freely in a turn of the century barnyard. It is a term used by scoundrels to deceive. Free run eggs look like ordinary cruel eggs. Aka cruelty-free eggs. Come from chickens kept in barns, packed cheek by jowl, not permitted to go outside. Chickens are never kept in cages, so this means nothing. from chickens raised without pesticides in their food, not that the chickens were necessarily treated humanely. These look and taste almost identical to ordinary eggs. 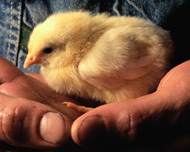 from chickens were deprived of eating their natural diet of insects pecking in the grass and forced to eat only grain. aka yard eggs. Raise chickens in your back yard allowing them plenty of room to dine on living weeds and bugs and kitchen vegetable scraps. This is chicken heaven and produces the highest quality eggs. You will find neighbours raising chickens will be more than willing to help you get started. By law, all eggs in the USA and Canada may not contain hormones, so this means nothing. According to Mother Earth News free range eggs are much more nutritious than factory eggs. Here is my time-tested scrambled egg recipe. I have been making it since I was about 9. (I’m now 70 years old.) I have gradually embellished it over the years from a simple recipe that came with the family’s indestructible Sunbeam electric frying pan. 6 large free range (not free run) eggs. I prefer rich brown ones even though scientists say there is no difference. 6 tablespoons organic milk or cream. 1 to 2 tablespoons butter, depending on how decadent you are feeling. half-salt (half potassium, half sodium) or sea salt to taste. 2 fat garlic cloves. Regular consumers of the recipe get addicted and ask me to keep upping the garlic content. Locally grown, organic have the best flavour. Herbes de Provence (a mixture of southern French herbs (majoram, rosemary, thyme, sage, savory, lavender, anise) blended by McCormick). a copious quantity of grated cheese, any kind, even Parmesan. Please no process cheese or that plasticised stuff that looks and tastes like Silly Putty. Mozzarella is a little too chewy, but even it will do. If the cheese tastes pleasing on its own, it will almost surely work well in this recipe. If you want something tame, try Monterey Jack. steamed chopped asparagus (4 minutes in the microwave). chopped pepperoni or similar ready to eat sausage. chopped living basil grown in your home in an AreoGrow AeroGarden. By varying your choice of optional ingredients each time, your family will eagerly anticipate the surprise every time you serve it. Not only does this taste delicious, it fills the air with delightful odours of anticipation. It is a bit like making a pizza. Put the butter in a frying pan and heat to medium. For an electric frying pan, set it to 160°C (320°F). I use a large, conventional, non-stick TeFal pan. 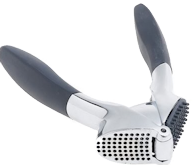 Either peel and finely chop the garlic cloves or squeeze them through a garlic press (I recommend the Trudeau soft handled, heavy duty garlic press. It is reasonably sturdy and easy to clean.). 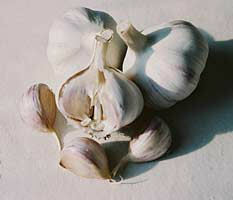 Brown the garlic and fill the house with anticipation of glories to come. Brown your optional ingredients with the garlic, except the cheese! Get some multigrain toast going and some fresh ground coffee. Mix the eggs, milk, salt and pepper in a bowl. To catch the splashing, put the bowl in the sink and whip with a Braun multimix until bubbly. For extra fluffy eggs, whip the whites and yolks separately then fold together. Pour the egg mixture into the butter and garlic. Keep scraping the mixture off the bottom of the pan and turning it over using a Teflon egg flipper. Don’t be too compulsive about this. The more relaxed you are, the more generous the chunks of egg will be and the more likely they will be lightly browned. You mainly want to avoid burning. Alternatively, if you are in a hurry, you can cook the mixture in a microwave in two batches for about 2 minutes. This creates a fluffy but leathery result. Just before the eggs are ready, toss in the grated cheese. If you put it in too soon, it will make the eggs lumpy. If you wait too long it won’t have time to melt. You will just have to learn by experience to get the timing just right. Err on the side of too late to start. Don’t wait until every last drop of the liquid has congealed before taking the pan off the heat. It will continue to cook of its own accord even on the plate. It is best to serve the eggs slightly too sloppy than slightly too leathery. Turn out onto buttered multi-grain, oat or flax toast. You can cut the toast up into 1 inch squares for children or to pamper adults. Serve with a mug of freshly ground fair trade coffee and some exotic juice. This makes enough to serve three adults if no one has seconds. Don’t be afraid to vary the proportions, particularly the egg-milk ratio. Try this recipe just once and compare it with restaurant scrambled eggs made with anemic caged eggs. I think the taste difference will convince you to switch to free range, even if you don’t care about the animal cruelty issue. and also offered it as an incentive for pledges. Unfortunately it is no longer in print. German with English subtitles. They speak extremely clearly. I found my year of high school German flooding back. This is a very low budget film. It is a gentle look at the crazy things humans do to produce their food industrially, like discarding mountains of bread each day that is still completely edible, creating genetically modified foods without flavour, but look spectacular, covering the land as far as the eye can see in greenhouses in Spain, manufacturing chickens with crowding, assembly lines and automation on a scale that beggars the imagination, burning wheat and corn, letting fish age for months until it is soggy, putting African farmers out of business then exploiting them when they head north to seek work. It depicts European practices which are considerably better than North American. Corporations consider nothing but increasing profit. This leads them to do bizarre, cruel and foolish things. 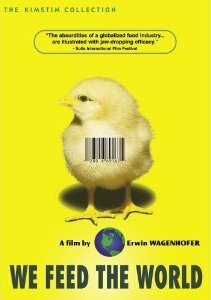 The film also points out that there is an abundance of food in North America and Europe. We don’t need to sacrifice food quality to get sufficient quantity and sufficiently low prices.